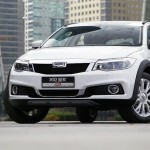 After getting the teaser image last week, and car lovers waited for the real feelings to watch the Qoros 3 City Suv. It will make its debut run in 2014 Guangzhou Auto show which will occur within a few days in this month and available in China sometimes in 2015. 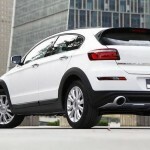 This 3 hatch based SUV has the similar design like its predecessors Qoros models. The door panels and wheel arches are made of black plastic. It has the higher ground clearance. The dual exhaust pipe system is integrated by the diffuser of the rear which is made of matte silver plastic body. The interior has the similarity with its previous generations that is 3 hatchback. 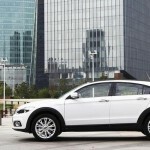 According to Qoros claim, it will offer “commanding driving position”. As the company tries to keep the basc model’s price reasonable, leather seats, automatic air conditioning system , touch screen display all will be optional. It will come with a 4 cylinder and 1.6 liter engine which comes along with 124Bhp, and 154 Bhp power outputs. The car comes with 4,452 mm length, 1,854 mm width, 1,504 mm height, and the wheelbase will be 2,694mm. We have to wait to get more information till its first run.